Beginning in 1947, the United States Mint began offering sets of uncirculated coinage representing each denomination and mintmark from any given year. Until 1959, mint sets were packaged in cardboard panels and included two examples of each issue, thus giving rise to the “double mint set” nickname often given to these early uncirculated sets. In 1959, mint sets were packaged in cellophane envelopes, with coins from the Philadelphia Mint receiving their own cellophane package (bearing blue stripes on the edge) and Denver coins assembled in their own, red-striped cellophane package. The United States Mint temporarily halted production of both proof sets and standard mint sets from 1965 through 1967, but in their place were issued so-called “Special Mint Sets” which bear a single coin of each denomination. Coins in the 1965 Special Mint Set range in quality, with some bearing dull, matte surfaces and a relative few containing coins with dazzling proof-like finishes. The quality of the coins in the Special Mint Sets was noticeably improved in 1966 and 1967, with most pieces from those years exhibiting neatly mirror-like fields and – in some cases – frosted cameo devices. As the San Francisco Mint produced various circulating issues from 1968 through 1981, “S” mint coins were included in either Philadelphia or Denver Mint cellophane packs, depending on the number of coins issued by a given mint during a particular year. Uncirculated sets issued from 1947 through 1981 come in plain manila or white paper envelopes bearing minimal identification as to the contents within. Federal budget cuts in 1982 and 1983 meant a temporary halt in official mint set production, but the popular annual sets returned in 1984, for the first time coming in more artistic outer envelopes with full, four-color photographs and graphic designs. 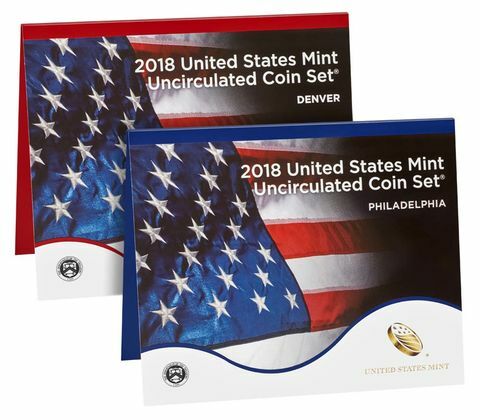 As the number of coins offered in uncirculated sets grew beginning with the 50 State Quarters program in 1999, the US Mint switched mint set packaging to more rigid panels in 2007 and continues using this format today.